In many ways the most modern of Italian cities, Milan is a busy, elegant metropolis with an impressive list of grand palaces, fine churches, and important museums. Satisfy your inner culture vulture at Duomo di Milano and Basilica di Sant'Ambrogio. You'll discover tucked-away gems like Borgo Castell'Arquato and Cathedral of Como (Duomo). 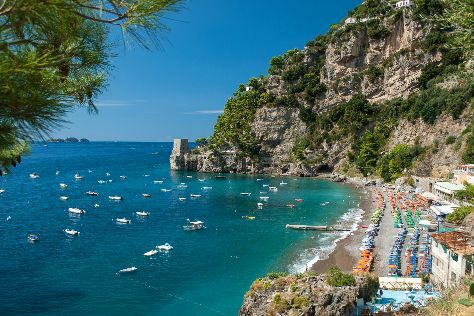 Get out of town with these interesting Milan side-trips: Lido di Menaggio (in Menaggio), Villa del Balbianello (in Tremezzina) and Lido di Moltrasio (in Moltrasio). There's more to do: tour the pleasant surroundings at i Giardini di Villa Melzi and kick back and relax at Le Serenelle. To see more things to do, other places to visit, ratings, and tourist information, read Milan online attractions planner . Bangkok, Thailand to Milan is an approximately 14-hour flight. You can also do a combination of flight and train. Due to the time zone difference, you'll gain 6 hours traveling from Bangkok to Milan. Plan for little chillier temperatures traveling from Bangkok in June, with highs in Milan at 33°C and lows at 20°C. Finish your sightseeing early on the 6th (Mon) to allow enough time to take a train to Verona. Do some cultural sightseeing at Il Vittoriale degli Italiani and Museo di Castelvecchio. Escape the urban bustle at Mountbaldo and Parco Naturalistico delle Cascate-Family. Explore the numerous day-trip ideas around Verona: Castel Thun (in Ton), Lago di Tenno (in Tenno) and Parco Giardino Sigurta (in Valeggio Sul Mincio). There's lots more to do: experience the emotional art of opera at Arena di Verona, examine the collection at Casa di Giulietta, take in panoramic vistas at Torre dei Lamberti, and meet the residents at Parco Natura Viva. To see more things to do, maps, ratings, and more tourist information, go to the Verona online driving holiday planner . Take a train from Milan to Verona in 1.5 hours. Alternatively, you can drive. In June, daily temperatures in Verona can reach 34°C, while at night they dip to 20°C. Finish your sightseeing early on the 10th (Fri) to allow enough time to take a train to Bologna. Do some cultural sightseeing at Museo Ferrari and Basilica di San Petronio. Discover out-of-the-way places like Basilica - Santuario di Santo Stefano and Santuario di Madonna di San Luca. Explore Bologna's surroundings by going to Acetaia di Giorgio (in Modena), Museo di Casa Romei (in Ferrara) and Massaggio Californiano (in Vignola). There's still lots to do: ponder the design of Fontana del Nettuno, get outside with Giardini Margherita, stroll through Parco Storico di Monte Sole, and don't miss a visit to Torri degli Asinelli e Garisenda. For traveler tips, more things to do, and tourist information, read our Bologna trip planning website . Traveling by train from Verona to Bologna takes an hour. Alternatively, you can drive; or take a bus. June in Bologna sees daily highs of 34°C and lows of 19°C at night. Wrap up your sightseeing on the 13th (Mon) to allow time to take a train to Florence. 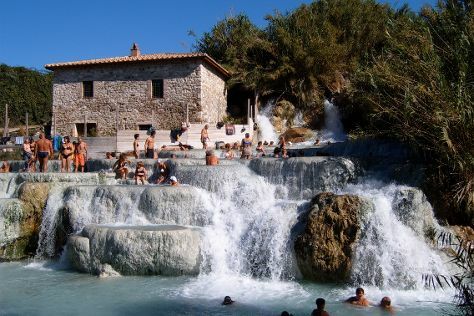 Step off the beaten path and head to Bagno Grazia and Hidron. Academy Of Florence Art Gallery and Uffizi Galleries will appeal to museum buffs. Explore the numerous day-trip ideas around Florence: Leaning Tower of Pisa (in Pisa) and Le Pavoniere (in Prato). There's still lots to do: take in the spiritual surroundings of Cathedral of Santa Maria del Fiore, don't miss a visit to Piazza della Signoria, indulge your senses at some of the top wineries in the area, and kick back and relax at Easy Living - Spiaggia sull'Arno. To find other places to visit, ratings, where to stay, and other tourist information, refer to the Florence trip itinerary planner . You can take a train from Bologna to Florence in an hour. Alternatively, you can drive; or take a bus. In June in Florence, expect temperatures between 33°C during the day and 21°C at night. Wrap up your sightseeing on the 17th (Fri) early enough to drive to Siena. Siena, a medieval Tuscan city, features numerous attractions, including a historic town center, alleyways, towers, and well-preserved buildings. You'll discover tucked-away gems like Cascate del Mulino and San Gimignano Bell Tower. Your cultural itinerary includes sights like Torre del Mangia and Piazza del Campo. You'll find plenty of places to visit near Siena: San Gimignano (Torre Grossa, Piazza della Cisterna, & more). Next up on the itinerary: get lost in a book at Biblioteca Piccolomini, contemplate in the serene atmosphere at Battistero di San Giovanni, explore the galleries of Complesso Museale Santa Maria della Scala, and steep yourself in history at Basilica di San Domenico. To find maps, where to stay, ratings, and tourist information, read Siena trip planner. You can drive from Florence to Siena in an hour. Alternatively, you can take a bus; or take a train. In June, daytime highs in Siena are 34°C, while nighttime lows are 19°C. Wrap up your sightseeing on the 21st (Tue) to allow time to drive to Rome. Satisfy your inner culture vulture at Palatine Hill and Colosseum. Appreciate the collections at Vatican Museums and Museo Centrale del Risorgimento. When in Rome, make a side trip to see Stabilimento Balneare Amerigo in Terracina, approximately 1h 55 min away. Next up on the itinerary: contemplate the long history of St. Peter's Basilica, take in the spiritual surroundings of Chiesa di Sant'Ignazio di Loyola, explore the world behind art at Galleria Borghese, and admire the striking features of National Gallery of Ancient Art in Barberini Palace. To find photos, traveler tips, more things to do, and other tourist information, read our Rome trip planner . You can drive from Siena to Rome in 2.5 hours. Alternatively, you can take a bus; or take a train. In June, daily temperatures in Rome can reach 34°C, while at night they dip to 21°C. Wrap up your sightseeing on the 25th (Sat) early enough to take a train to Pompeii. Pompeii has been a tourist destination for more than 250 years. Satisfy your inner culture vulture at Pompeii Archaeological Park and Museo Archeologico Nazionale di Paestum. Explore the numerous day-trip ideas around Pompeii: Fornillo (in Positano), Il Tempio di Nettuno o Poseidone o di Hera II (in Paestum) and Borgo Medievale di Agropoli (in Agropoli). The adventure continues: steep yourself in history at Villa Cimbrone Gardens, admire the landmark architecture of Villa dei Misteri, explore the ancient world of Casa del Fauno, and don't miss a visit to Villa Rufolo. To see reviews, where to stay, other places to visit, and other tourist information, go to the Pompeii road trip planning site . Traveling by train from Rome to Pompeii takes 2.5 hours. Alternatively, you can drive; or take a bus. In June, daily temperatures in Pompeii can reach 32°C, while at night they dip to 22°C. Wrap up your sightseeing by early afternoon on the 28th (Tue) to allow time for travel to Venice. Start off your visit on the 29th (Wed): contemplate the waterfront views at Canal Grande, then make a trip to St. Mark's Square, and then enjoy the sand and surf at Blue Moon. Here are some ideas for day two: admire the striking features of Basilica di San Marco, then don't miss a visit to Dorsoduro, and then admire the landmark architecture of Doge's Palace. To see where to stay, other places to visit, maps, and other tourist information, read our Venice trip itinerary planner . You can do a combination of train and flight from Pompeii to Venice in 6 hours. Alternatively, you can take a train; or drive. In June, daily temperatures in Venice can reach 32°C, while at night they dip to 20°C. Finish your sightseeing early on the 30th (Thu) so you can travel back home.